A solar-powered handbag designed by a student from Brunel University promises to make finding keys and other items at the bottom of a bag easier. The handbag, dubbed Sun Trap, uses a solar cell attached to the outside of the bag to trap energy from sunlight. The energy is stored in an internal battery which lights up the lining. 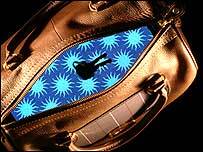 The lining is made from an electroluminescent material similar to that found in mobile phones and is lit up by the bag's zip which acts as a switch. The bag goes dark when the zip is closed or after 15 seconds if it is accidentally left open. A secondary use of the portable battery is as an emergency charger for mobile phones and other wireless devices. Safety and usefulness were uppermost in Rosanna Kilfedder's mind when she came up with the design. "I had the idea for Sun Trap handbag after seeing so many friends frantically searching their bags for house keys, usually on a dark doorstep," said Ms Kilfedder. "I also noticed friends using their mobile phones like torches to examine the contents of their bag, which gave me the idea of lighting up the bag," she said. The battery should not need conventional charging as it will be topped up every time the bag is outside, but it does have the facility to be charged from the mains as a back-up. Ms Kilfedder's bag design has already won a competition held at Brunel University aimed at finding a new generation of entrepreneurs. Brunel Enterprise Centre, an organisation set up to help students develop their ideas commercially, is helping her apply for a patent and eventually get the bag on the High Street.